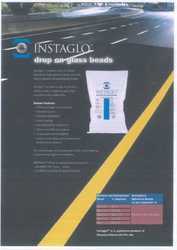 Instaglo® Glass Beads provide uniform retro reflectivity in all conventional road marking materials. These beads are dropped on the surface of the paint for optimum penetration. All stones in available this product. We have established ourselves as reputed enterprise manufacturing and supplying superior quality Drop on Glass Beads. 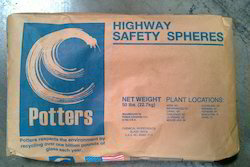 Made by a unique and revolutionary manufacturing process comprising of purest form of raw materials that are melted into highly reective material and shaped to nest microspheres of nearly 100% roundness. Specifications: Specific gravity (g/cm3): 2.4-2.6 Refractive index: >1.5 Spherical beads (%)80.